Microsoft is changing the Microsoft Certification Program (MCP) for IT professionals and developers. The changes are being made to meet the growing skills gap in the technology industry. Microsoft has created three levels - Associate, Expert and Master – to helps professionals have a clear idea of the career path they are embarking on, from the basic level to the most advanced. 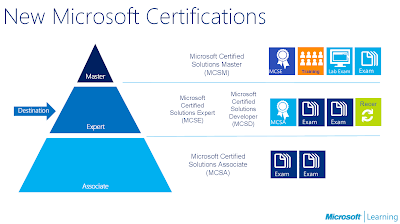 The certification levels are now updated to be more solution-oriented. They keep in check the industry’s changing needs, while ensuring quality and relevance. Companies all over the world have embraced Cloud Computing solutions, resulting in an upward trend for the demand for skilled professionals in Cloud Technologies. Forecasts estimate that by 2015 IT cloud services will generate almost 14 million jobs worldwide. Microsoft has reinvented their mainstream certification Microsoft Certified Solutions Expert (MCSE) to incorporate Cloud. The new MCSE certifies that you have the competency to work with new ‘ever-expanding’ technologies. MCSE is for those who plan to implement cloud solutions in their companies. It is ideal for IT professionals and developers who are proficient with Microsoft Technology Solutions. As a matter of fact, love is the affections for somebody. When we turn out to be closest companion with other love makes. We should make our consistently exquisite on the grounds that it assignment writing services gives us fulfillment just as satisfy us. To appreciate the existence we ought to do such things which fulfill us. This decision is fully dictated by the fact that the company has continuously decided to follow the path of a pioneer in all existing opportunities and develop new ones.